Own and manage your content. Easier than ever. We know content is king when it comes to intranet success and that's why Unily's Digital Experience Cloud has been designed to give content owners total control and flexibility over content delivery; zero technical experience necessary. A rich feature set of content management tools empower your content owners to design, create and push content that delivers real engagement. Drag, drop, preview, target - it's that simple. Features including ownership assignment, approval workflows, content targeting and automated publishing come together to deliver the smoothest editor experience, allowing your content managers to focus on what matters: producing quality content for their demanding audiences. It has never been easier to create and manage your content using Unily’s DXC. 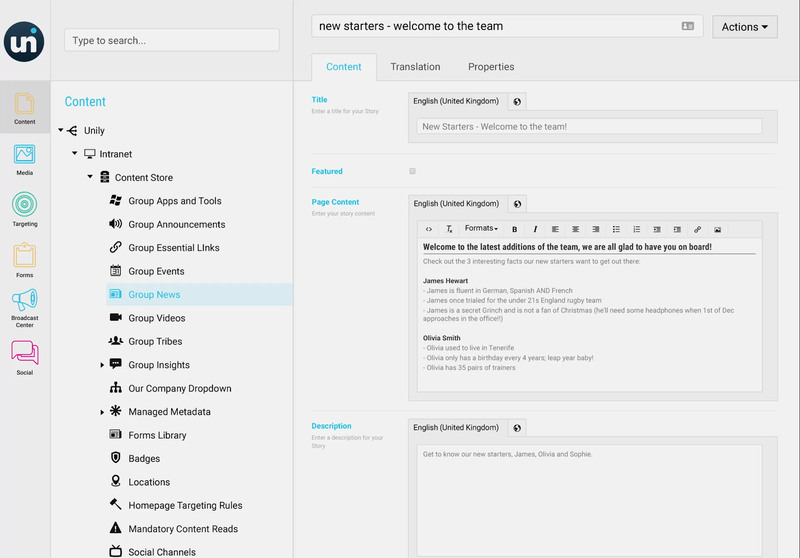 With the ability to organize content into a structured tree and control permissions across it, your content managers can cut down the noise and get content into the hands of users faster. Content types with simple templates result in consistent and expertly designed content every time. Through the innovative grid and widget system, stand-alone pages or even entire sites can be designed with total flexibility for maximum impact. All the content you create features optional approval workflows that support quality control where needed. This, combined with content scheduling, gives your editors more control with less effort. With dashboard views of the content you own, as well as in-situ content analytics, it is easier than ever to manage and measure the content you are responsible for. If you need to drive user engagement, promote a new initiative, or simply catch your users’ attention, Unily’s DXC will ensure your messages reach the right audience. Schedule homepage takeovers ahead of time, target different campaigns to different audiences and make changes on the fly, all with easy-to-use features. Create a campaign hashtag to aggregate articles, images, or even social threads, giving your campaign the momentum it needs to succeed. And just when you thought you'd exhausted all avenues, you enter the broadcast centre where you can build-out email newsletters in rapid time and send out on-topic notifications that guarantee your target audiences will respond to your content. Using the Unily DXC’s comprehensive built-in analytics service, you can track user engagement with your campaigns with intuitive dashboards that show traction in real time. Mandatory content. Compliance made simple. Distributing business-critical information to a specific audience or getting users to complete an essential task can be challenging to manage. Mandatory Content Reads take the pain out of critical content delivery, allowing you to easily distribute information and track consumption for compliance purposes. A handy reading list will help users to manage their mandatory content and review it in the future. If a user doesn’t complete a Mandatory Read before the deadline, they will have restricted functionality until they do. The Broadcast Center is a vital communications tool for sending out email newsletters and cross-device web and push notifications, letting you deliver essential messages and crisis communications to users in real-time across any channel. Dynamic notifications give your users a highly personalized experience that lets them remain up-to-date with all the content and channels they have chosen to follow. Using manual notifications you can also send out critical alerts in real-time to make sure users never miss anything they shouldn’t. With the Broadcast Center’s email newsletter feature you can design compelling email content using an intuitive set of responsive templates, no code needed. Built directly within Unily’s DXC, you can simply drag and drop elements into place and then use dynamic queries to search for content such as the latest articles to instantly build out a weekly comms round up in just a few clicks. With email scheduling, you can rest assured that your messages reach your audience at the right time for them, with no stress for you. You should only have to publish content once for it to add value to every user. With Unily DXC’s unrivalled multilingual capabilities you can break down language barriers using one click content translation into dozens of languages. Where necessary, you can also choose to manually translate content to ensure word-perfect translations for your business-critical content. Platform specific labels are all translated through our central dictionary service, ensuring every user journey is exceptional and nothing is ever lost in translation. With Unily’s Digital Experience Cloud content types are endlessly extensible to support all of your portal requirements - including product pages, ideation hubs and customer support wikis. Adapt your information architecture to suit your requirements and create new and exciting digital content on demand. With intuitive content type definitions, the possibilities are endless. Create new content types in a matter of minutes, and then easily tailor the design and layout to deliver the perfect user experience. Upload and access your files through a single experience. With Unily’s configurable document center you can integrate your best-of-breed document management solutions directly into your portal, providing users with seamless, omnichannel access to the content within. With the ability to configure additional document sources quickly and easily, and a document center capable of respecting permissions set at the source, you can take even more advantage of your existing investments. Integrating common document management solutions including SharePoint Online, OneDrive for Business, Google Drive, Dropbox and Box has never been easier to achieve. In addition, if you have a need for a lightweight file storage solution, then look no further. Beyond Unily’s DMS integration options, the platform also offers file storage and management in the content management system, with libraries, folders, metadata tagging and the ability to make documents private to specific audiences. Rich media is the cornerstone of designing highly engaging and exceptional user experiences. With a dedicated media center, Unily's DXC makes it easier than ever to work with your media to design engaging content. With the ability to create your own media folder structure, and permission folders for different users, any image can be securely stored for use with any type of content. Using Unily's automatic rendition system, you can drag and drop images directly into media folders and know that it will look great wherever they are used. With Unily's integrated license free image gallery, you also have one-click access to thousands of high quality images that you can download directly into your your cloud as required. Gather information, support registration and streamline business processes with ease using Unily’s digital forms and simple automated workflows. Forms are mobile-friendly, so users can fill them out on-the-go, encouraging action and increasing response rates. Workflows can automate the notification of new responses and support approval processes, notifying named individuals or specific mailboxes by email. Empower users to contribute better than ever. With powerful front-end content creation, it has never been easier for your users to contribute to your enterprise portal. Empower users with simple-to-use and familiar tools to generate knowledge, share information and collaborate more effectively. Whether uploading documents, sharing best practice or creating a new project milestone, contributing content takes seconds. Used in combination with site templates, enable your users to take control of their collaboration spaces supporting self-service and empowering them to begin collaborating faster than ever. Let users spin-up and administer new team and project areas directly from the front-end, giving them the freedom to innovate and achieve their potential.